From the start of time, a new chapter of grace. Upon His mountain, to stand still with Him there. Nourishing her life with music bright. As she grew and matured, she needed no proof. Then Colorado called, to the Rockie’s high, fragrant woods. With God she wrestled for souls, a long, holy fight. So each person who came could hear and answer His call. We’ll not forget your deep faith, and heaven’s high goal. Until the Resurrection comes, in Christ’s Holy Name. You welcomed them all to the clear mountain air. As the Mountain waits for another – to honor your greatness. Of the Father, Son and Holy Spirit – Trinity, one God, come! Be hidden – be a light to your neighbor’s feet. Go without fears into the depth of men’s hearts … I shall be your rest. Lucille and I shared a love for the Eastern tradition of the Church. When we first met, more than twenty years ago, that love meant for me, primarily, an enthusiasm for the liturgy and iconography of the Slav-Byzantine churches, as well as a fascination with the mystical theology of the Church Fathers expressed in that tradition. Lucille loved those things, too, but not quite in the same way I did. She even had to warn me once, and rightly, against making an idol of those traditions. For her "East" meant something both simpler and more elusive. She could use the term "East", for example, not only to contrast the spirituality of Eastern Christians with the outward, action-oriented piety of Western Christians, but even to highlight what she admired in the mentality of the Native Americans she had known and served, a mentality so different from that of urgency and distraction that surrounds most of us. I think that what she valued most in what she called "the East" was hiddenness and the slow, patient work of love done in hiddenness. Some years ago when she and I set about creating a website for Our Lady of Tenderness Poustinia, she chose two short texts to communicate her vision of the place and what happened there. The first was taken from the Prophet Hosea, "I am going to lure her and lead her out into the wilderness and speak to her heart." Certainly, this verse summarizes Lucille's love affair with the Lord; but that experience is also one to which she invited us and for which Our Lady of Tenderness exists. The second text was a simple, one-sentence description of what it means to be a poustinik. "The desert dweller, the poustinik, cultivates his heart until it becomes a garden enclosed, a sacred place where God may dwell." To cultivate one's heart, to become an enclosed garden, to become a sacred place where God may well -- that is the work a poustinik does and for which a poustinia exists. It is by its very nature a slow and hidden work. When I met Lucille, I loved the beauty of Eastern liturgy and prayer and theology, but I did not grasp as clearly as she did the reason for cultivating such a garden. I cultivated mine because it pleased and delighted me. She cultivated hers for the sake of the one who had lured her out into the wilderness and spoke to her there. Her hidden garden of the heart was meant to please, not herself, but the one she called her Beloved. Lucille and her Beloved were never selfish lovers who wanted to keep the garden to themselves. On the contrary, nothing gave Lucille more delight than when one of us would visit that enclosed space and meet her Lord, and so become gardeners ourselves, cultivating our own hearts as sacred places for God to dwell. The hut of a Russian poustinik has no lock, just a latch to keep out the wind. Nor was there a lock on the gate of Lucille's heart. How many of us, and how often, walked in and out of that gate, whether by visiting her on the mountain or by picking up the phone. Lucille's hiddenness did not mean that she did not want us to find her. What it meant was that when we did find her, we discovered something unexpected and beautiful waiting for us. Now the Lord has lured Lucille to another place. For most of us death still looks like a journey into a bleak wilderness, but Lucille looked forward to it as a voyage to the hidden garden that her Beloved began cultivating for her long ago, which was reserved for her at her baptism and for which she longed all her life. "In the place of rest which is yours, O Lord, where all your saints repose, give rest to the soul of your servant; for you alone are the Lover of mankind." My next few posts will include some poetry and theological reflection on the life of Lucille Dupuis and the meaning of her witness in Northern Colorado. Roxanne King of the Denver Catholic Register wrote a beautiful article for those wanting a little more historical background. In this post, Father Raymond Gawronski SJ, a visiting scholar of the Dominican School of Theology in Berkeley, sent me his own reflections on her life. While he was Spiritual Director of Saint John Vianney Theological Seminary in Denver, he found in Lucille a reliable spiritual friend and intercessor for his mission. She also found in him a solid theological and spiritual sounding board for her life of intimacy with God and availability to those in need of a word of hope. This offers a very honest look at both her struggles and her witness at Our Lady of Tenderness - God's Mountain. Father Gawronski contributes to the Magis Center for Catholic Spirituality. She was a wild woman. Her large black eyes flashed fire. Her jaw, square and strong, shouted determination, iron determination. Her grey hair was never quite tidy, it always felt wind-blown as if the Holy Spirit were always somehow blowing her around. Yet she was solid, very solid, a squarely built woman, large feet planted squarely on earth. Lucille Dupuis was born into a complex world of French Canadian immigrants to New England, her mother’s people humble lobstermen and fishermen from Prince Edward Island, her father’s people much more elegant Gauls from Quebec and Nova Scotia before that. She loved both sides. But her parents were humble people, much reduced in the world: they lived in a trailer in their later years. From earliest childhood she wanted to passionately love God. But she could not find this passionate love confirmed or nurtured anywhere, not enough. Surely the Catholic schools of her girlhood, her Catholic college in the Connecticut where she was raised taught her the Faith as one learns items in a catechism. But her soul craved more, and she found it at Madonna House, in Combermere Ontario. The love of her life was God. But the form in which He came to her above all was in the person of Catherine de Hueck Doherty, Russian born foundress of Madonna House. It may be that Lucille was in fact destined to be her successor. She certainly lived years of a rigorous formation in places like Whitehorse – living for years with the Indians in the Sub-Arctic wilds of western Canada. But something went wrong and Lucille was expelled from the order without a word. Catherine utterly ignored her after that, treating her as if she did not exist. Lucille’s world collapsed at that time, and with the collapse of the outer world came the collapse of her inner world as well. With God’s grace, and the help of good people, she regained her equilibrium. She lived for awhile in Newport with Ade Bethune, one of those figures of the generation of Merton and Day and de Hueck and de Vinck, Catholic lay intelligentsia giving birth to the Church in post-immigrant America. She found a livelihood being a nanny for the large families of Naval officers, based in eastern Virginia. She lived with and served them at Guantanamo base in Cuba. Hungry for the living Spirit of God, she became taken with the charismatic movement in the Church –and the Spirit of God whisked her off to Estes Park, Colorado, where she felt called to go – and listen for God’s further word. And so it emerged: the dream that became “Our Lady of Tenderness Poustinia.” The Lord sent her companions, and together with them, and with the help of many, she organized and had built a beautiful chalet with two poustinia (prayer) cabins on isolated acreage surrounded by National Forest: God’s Holy Mountain. She developed an entire spirituality of the holy mountain, the place of prayer – relying on Scripture, and prayer experience. 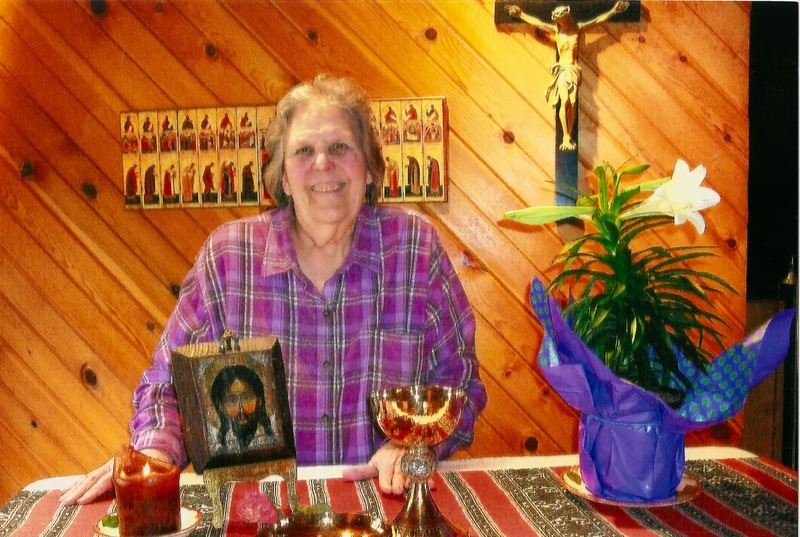 Finding friends in the Catholic world, and perhaps even more in the world of Evangelical Protestantism, she became a living link with God for many. Available to anyone for spiritual conversation, in person or on the phone; offering the cabins where one could go to meet God and themselves. She early found support in the Church. Archbishop Stafford visited, and was so impressed he gave her permission to reserve the Blessed Sacrament in her chapel, and donated a set of vestments for her house of prayer. Many years later, Auxiliary Bishop Jim Conley would visit and also savor the deep grace of the charism, of the place. Lucille had many trials and many struggles “on the mountain.” Some of them came from without, sadly, from the local parish which long disowned her, and from an archdiocese which showed no interest in her profound self-donation, and lifetime of prayer and fasting and sacrifice for God – and her availability to hundreds if not thousands of hungry souls. People would come to her with their wounds –and perhaps she especially drew wounded people, who all too often would wound her and leave her bleeding alone. She herself was a wounded soul. Perhaps her one great error was living without a spiritual director, for the soul who ventures into the world of God all alone runs a terrifying risk of identifying themselves with God. This is especially so if the soul is spiritually gifted and so cut off from the ordinary run of humanity. Combine that with a prophetic vocation, and grave dangers become inevitable. Church authority played very little positive role in her life, yet though often tempted by the goodness of her many Protestant friends she remained a loyal Catholic. Still, the benefits of Church authority – spiritual guidance above all – were simply not to be had in her part of the world, and she was left on her own. This was not helped by the very strong-mind which had created this poustinia in the first place. Our vices are the obverse of our virtues. Her great tenderness and concern at times could be overshadowed by a wounding harshness which had more of the Old Testament prophets to it than anything quietly flowering in Mary. She was an imperfect vessel of God’s grace, but one who had said “yes” to God, and let herself be consumed by His plan for her life. Lucille had planned her funeral well for some years. She was concerned about the many pines killed by the beetle infestation of the Rockies, and had suggested to a neighbor that he develop a small industry of transforming the forest of dead trees into pine planks and then shaping them into coffins. It was in one of those coffins that she was lowered into the earth, on a beautiful snowy day in early February. Having given her all to Her Beloved, she has entered into His rest, and her great reward. God chooses the weak to shame the strong of this earth. Lucille was weak and wounded, considered crazy by the rich, the strong, those whose “sanity” rests on money and power and social mores. Perhaps her more disturbing confrontations could be considered “crazy wisdom” by the Tibetan Buddhists (for whom she would have had no time, alas). Certainly she who did not hesitate to call authority to keep young campers from building fires on the mountain would understand the prophet who summoned she-bears to kill youthful miscreants. She could be fierce and wild, and yet in the midst of that storm that was Lucille there was a peaceful and gentle and tender center, known fully to God alone, refreshing many in their – in our - desperate moments. May she enter into the heart of Our Lady of Tenderness and through it the eternal embrace of Her Beloved.